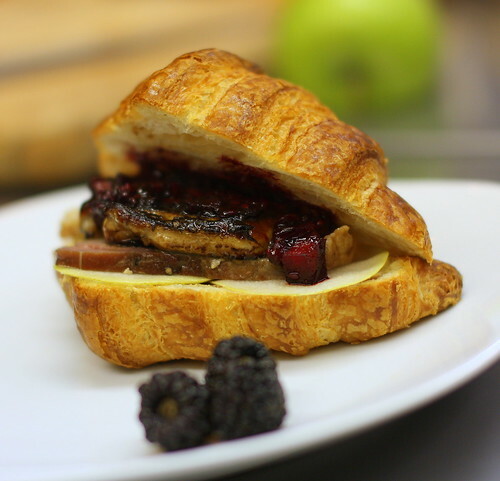 The “Foie You”, a croissant sandwich prepared especially for our friends at Farm Sanctuary. 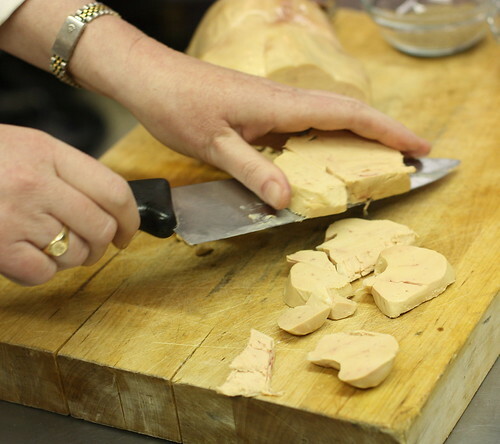 The “Foie You” can be purchased for $24.00 at Picnic Caterers in Emerson, NJ. This is a limited time offer and you must order the sandwich by noon Thursday the 23 st of April for pick-up on Friday the 24th. All profits from the sales of the sandwich will be donated to the Center for Food Action. 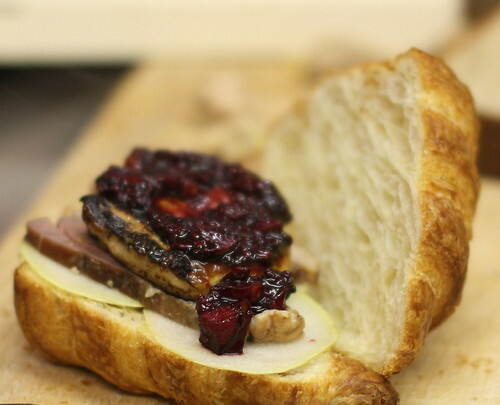 The sandwich will be offered weekly via special order until demand subsides. Like other industries, the restaurant and food business is no stranger to being targeted by extremist groups which have some bizarre notion that the animals which are being used for foodstuffs and other products have the right to be treated like human beings. Typically, however, these organizations, such as PETA, are more likely to spend their energies on large food distribution and manufacturing entities, and not on individual restaurants and small businesses. However, this is not always the case. 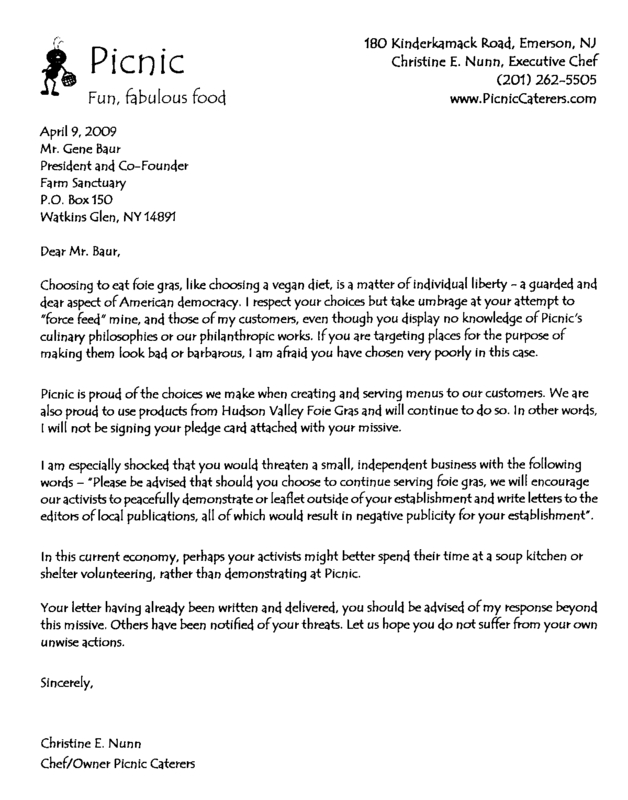 Recently, a friend of mine, Christine Nunn, who owns Picnic Caterers in Emerson, NJ, received a threatening letter from Farm Sanctuary, an special interest group which has a focus on protecting the rights of animals in our food supply. Christine received the letter no doubt due to her use of Foie Gras in one of her dishes at the Ultimate Chef Bergen County Finals. It should be noted that due to the fact that since Foie Gras is such an incredibly expensive ingredient, she only finds use for about two lobes total per year for special events and customers that specifically request it, so she shouldn’t be considered a mass consumer of Foie Gras by any stretch of the imagination. 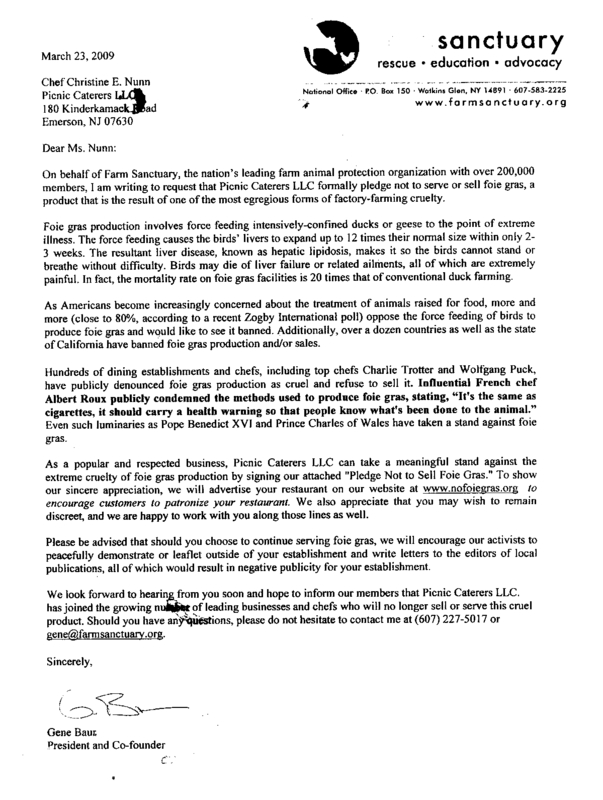 It should be also be noted that Christine only uses Hudson Valley Foie Gras, which is not raised in “intensively confined” environments that foreign Foie Gras producers use and is one of the elements of Farm Sanctuary’s complaints. As to whether the gavage feeding methods to fatten the ducks are “inhumane”, no conclusive scientific evidence has been found to date to support that the ducks being raised for Foie Gras actually feel any discomfort from the process, as they don’t eat in the same way human beings or other animals do and thus may lack a gag reflex. While Christine and I both believe that our food animals should be treated humanely, it should be a personal choice for chefs and restaurateurs to serve whatever ingredients they want to their customers, not via agendas that are forced down OUR collective throats by special interest groups. So for Farm Sanctuary, Christine has issued this response. Not to be bullied, we also decided that perhaps it was apropos to create a dish that was representative of our views on this matter. 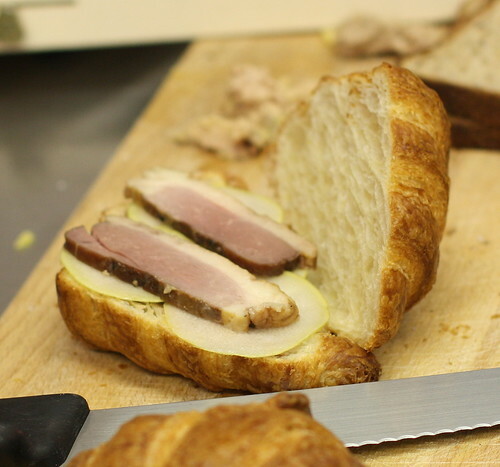 The “Foie You” Mise en Place: Croissants, Hudson Valley Foie Gras, Terrine de Foie Gras and Smoked Duck Breast. All the animal proteins were generously supplied to us courtesy of Ariane Daguin at D’Artagnan. 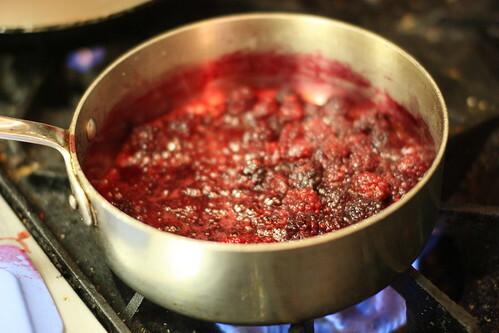 Blackberries are cooked in sugar with some added balsamic vinegar. 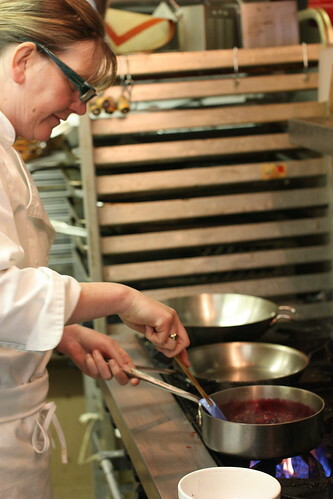 Christine cooking the blackberry jam. 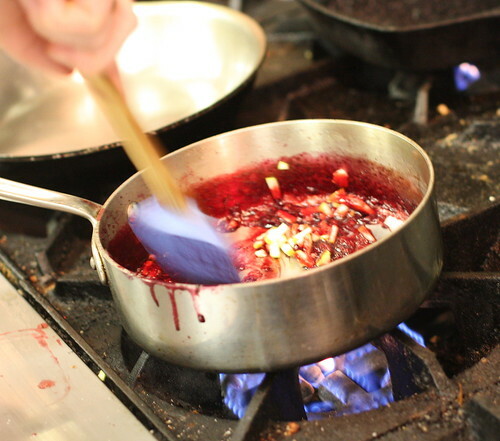 The blackberries are then strained of the seeds and put back into the saucepan. 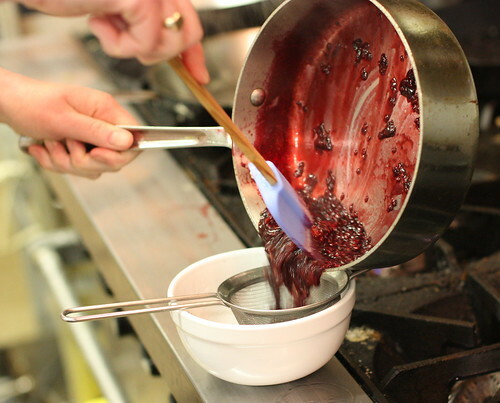 Some chopped green apple is added to the blackberries to release pectin which will help gel the blackberries into a jam for the sandwich. 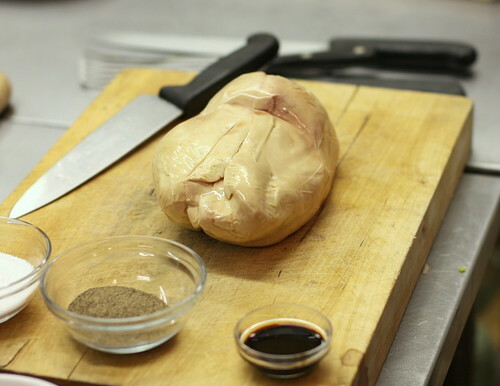 Our lobe of Hudson Valley Foie Gras. Which Christine slices up carefully. 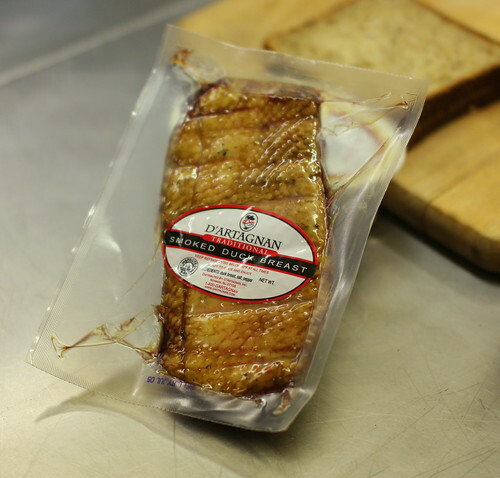 D’Artagnan Smoked Magret Duck Breast, which forms the other major protein component of the sandwich. Smoked Duck Breast is ready to eat. 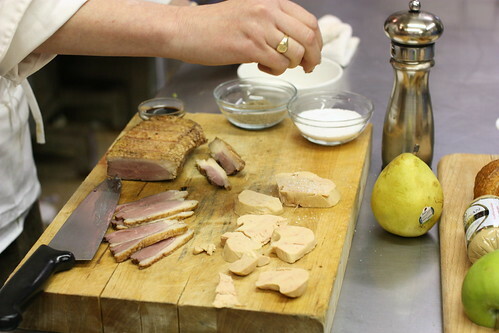 The duck breast is sliced and the Foie Gras slices are seasoned with salt and pepper. 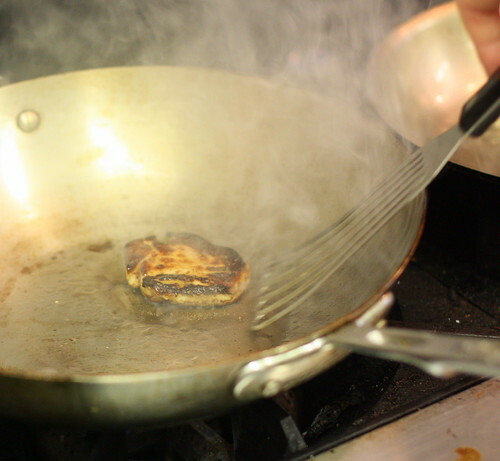 A slice of Foie Gras is quickly seared in a Saute Pan. 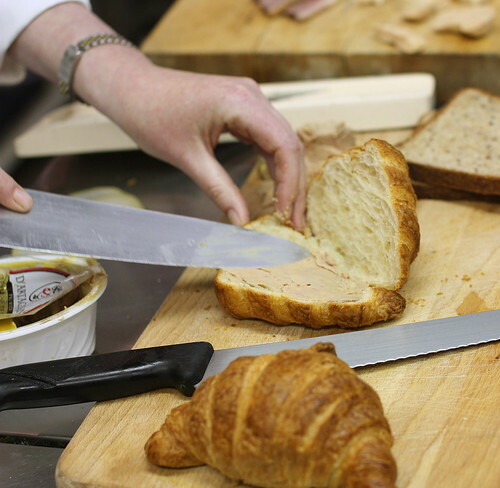 D’Artagnan Terrine de Foie Gras is spread onto the bottom layer of a croissant. Next, thin slices of pear, cut with a mandoline. Next, slices of smoked duck breast. And then the Seared Foie Gras. With some of the fresh Blackberry Jam on top. 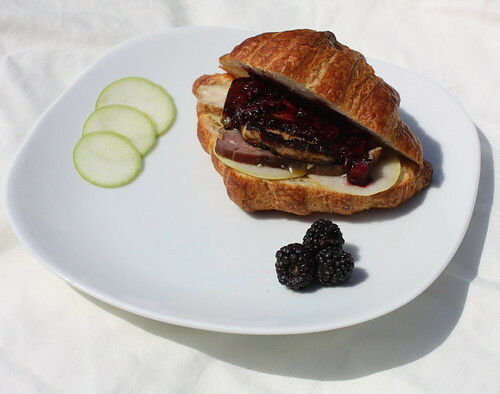 The finished sandwich, the “Foie You”. Rachel about to take her first bite of the Foie You. 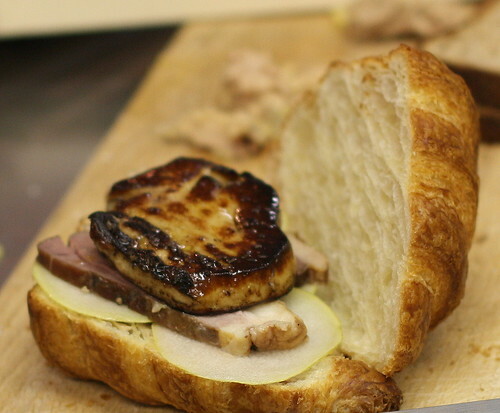 Picnic will be selling limited amounts of the Foie You next week for $24.00 each. To order a sandwich for Thursday pickup, please call (201) 262-5505. You must have your orders in by Tuesday. All profits from the sales of the sandwich will be donated to the Center for Food Action. This entry was posted on Sunday, April 19th, 2009 at 11:20 am and is filed under Food, General, New Jersey. You can follow any responses to this entry through the RSS 2.0 feed. You can leave a response, or trackback from your own site. Awesome blog post and im glad people respond to the animal rights extremists (nutjobs). The deranged notion that animals are the same as people (or better than people) is absurd. This sandwich looks amazing too! awesome! i used to sneak little crumbles of foie torchon, huckleberry jam & brioche when when i worked garde manger station at a french restaurant. bites of heaven! 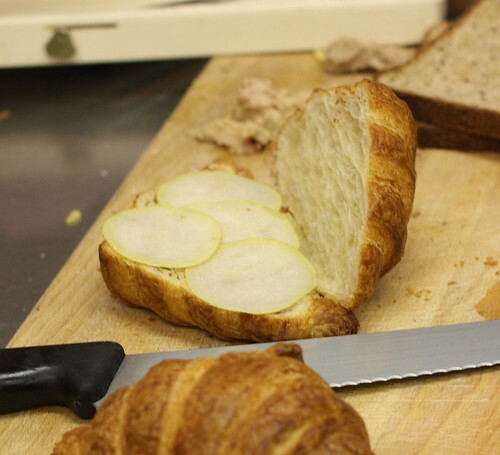 also, i developed a croissant recipe replacing butter with foie. Bravo! It’s too bad I am not in NJ or I would certainly have to partake in one of these delectably pithy “responses”. Unfortunately, there is no reasoning with these kinds of people, for they are interested in only hearing their own opinions repeated ad nauseum. Ah well, more for us I say. Good for you Christine! Idiot people, bullying small, independent, community-minded businesses. We support YOU! PETA: The opposite of MENSA! this sounds like the best thing in the whole entire world.